Home / غير مصنف / US storm Skylar MAP: How much snow will third Nor'easter Winter Storm Skylar bring? 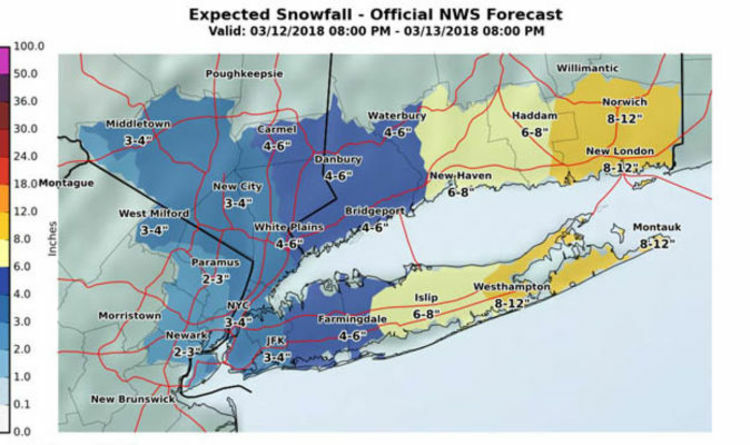 US storm Skylar MAP: How much snow will third Nor'easter Winter Storm Skylar bring? Winter storm Skylar is the third Nor’easter to occur in the past two weeks and follows on from two storms which hit the East Coast earlier this month, killing at least nine people and knocking out power to about 2.4 million people and businesses. New England is expected to face the brunt of the storm and a potential blizzard, with other states expecting heavy snow as well. Wind gusts of more than 60mph are possible from eastern Massachusetts to coastal Maine and blizzard conditions are expected in parts of eastern Massachusetts. The biggest impact in New England will occur on Tuesday morning through evening. A winter storm warning has been issued for most of New England and a winter storm advisory for central and eastern New York, New Jersey and Pennsylvania, the National Weather Service (NWS) announced. According to Weather.com the storm system will likely undergo rapid intensification known as a bombogenesis. It began to dump snow on the Mid-Atlantic states as of Monday evening and will reach the Northeast by Tuesday morning. Weather Channel meteorologist Carl Parker said: “The event will be a little colder, confining the heavier, wetter snow to coastal areas, where winds gusting to 40-50mph will lead to power outages, and possible blizzard or near blizzard conditions. “At least several inches are expected from upstate New York through New England, with as much as a foot or more in the higher terrain, in southeastern Massachusetts, an through much of Maine. How much snow will Winter Storm Skylar bring? Boston, including parts of Rhode Island, is expected to receive between 12 to 18 inches, according to Weather.com, with localised amounts of up to 22 inches, the NWS said in its warning. The NWS warned that travel during Tuesday morning and evening will be difficult to impossible. The city is not under a blizzard wanting, but the most southeastern parts of the state, such as Cape Cod, 18 to 24 inches of snow is predicted and the region is under blizzard watch. Lighter amounts of snow are expected further south in New York City and portions of northeast New Jersey, with between 2 to 4 inches of snow forecast. The areas of Long Island closest to New York City will not experience much accumulation, but snowfall increases farther to the east. Eastern Long Island and upstate New York has a good chance of picking up at least 6 inches of snow, but towns like Montauk on the outermost edge of the island could get 12 to 18 inches of snow. The majority of New Jersey should get around 1 to 3 inches of snow, according to Weather.com. Winter Storm Skylar had already dropped snow in parts of the US as of Monday evening, these are the select snowfall totals by state through early Monday morning.